4) Angle of the trunk leaning has become extremely curved. Trees may also be removed because they are an undesirable species for the location, an obstruction in the landscape or blocking new construction. 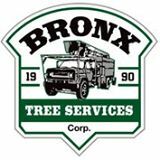 In the case your tree does need to be removed, Bronx Tree Services Corp performs tree removals safely, affordably and quickly! We are experts in dealing with the unique challenges of the Bronx landscape to get the job done! Call us today for an assessment and free quote! 24 Hr. Emergency Storm Response – In the event Mother Nature decides to remove trees, Bronx Tree Services Corp will respond in a timely manner to insure the damaged trees are removed safety from your home or property. If you are in need of tree removal services call Bronx Tree Services Corp. at (646) 852-3327‎ now.